This is the work of Ajis Mohamad, Malaysia's foremost underwater scenery artist. Ajis's work has a magical quality about it and if you have not dived before, you will not be able to fathom the realistic aspscts of his intricate pieces. This is one of his unfinished underwater scenes which I came across at Artists Colony at Conlay Craft Centre in Kuala Lumpur. 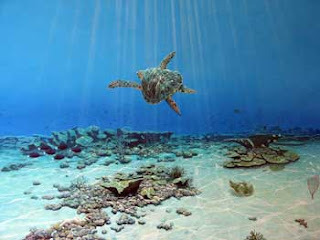 Look at the turtle which appears to be gliding through the crystal clear water with sunlight streaming through from above. On the sandy bottom, reflections of light created by the undulating surface of the crystal clear water is caught in this intricate oil piece. Ajis can be found at the Artists Colony on most days when he doesn't go diving. You can learn more about this artist here..